This atomizer head work with Joyetech eGo-C atomizer body. Cone shape/Type A and Joye eGo-T/eGo-C empty cartridges. It is also compatible with Joyetech eCab. 2.2ohm and 1.8ohm available. The latest 5pc Joyetech logo eGo-C/eCab/eRoll atomizer heads! Cone shape/Type A, the innovative changeable system parts. When the atomizer is broken or need changing, you just need to replace the atomizer head, which is highlight of this product: economical and pratical. 2 values are available: 2.2ohm and 1.8ohm. 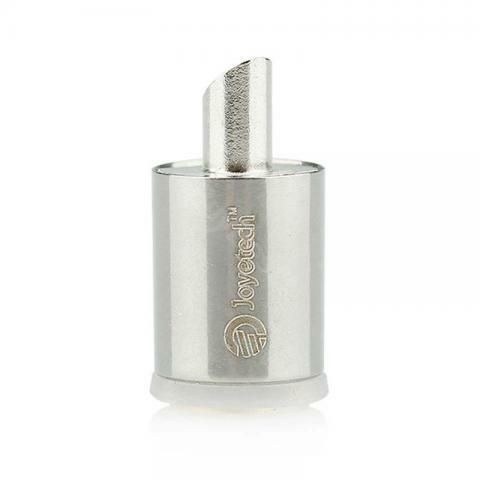 Attention: The new box of 5pc Joyetech logo eGo-C/eCab/eRoll atomizer heads! Cone shape/Type A is larger than before, but there is no change on products. If you put A type atomizer head into B type atomizer body, it may cause a little leakage. If you put B type atomizer head into A type atomizer body, it may cause a little burning taste. Through test, in order to reach the best effect, we recommend you not to mix type A and type B pack in use. • No warranty! It can only work with Joyetech eGo-C atomizer body! Cone shape/Type A and Joye eGo-T/eGo-C empty cartridges! Cone shape/Type A! It is also compatible with Joye eCab! Shipping is very fast! packing is super, how it works did not check because i took about the stock. Seller recommend. The package is super, how does not test because they took pro zapas. i recommend the seller.